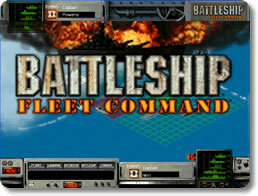 Battleship Fleet Command Game Review - Download and Play Free Version! 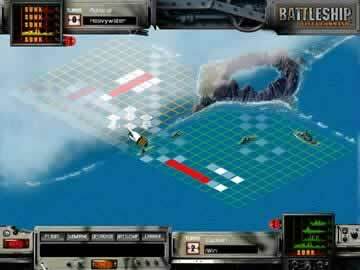 Deploy your naval fleet, choose the best shots, and blow your competition out of the water! Great updated features that advance the classic board game. Your success unlocks new fleets and weapons. Each boat in your fleet has different specialties and weapons. Game offers a strong strategic element. Game could get tedious after playing for awhile. No multiplayer or online mode. Same dialogue repeats after each turn. Classic board game for PC! It's Battleship Fleet Command! Station your fleet, and avoid detection by the opponent navy. There are two fleets at sea, but only one will survive. Fire strategically to locate enemy ships; once you've found a ship, fire to sink it. You'll be pulled into the action as canons fire with lifelike sound, and your radio indicates news of strike. Play Fleet Command mode and the strategy gets intense. Move your ships, fire different types of guns, and deploy defensive measures. Great mode that adds variety to the classic game. “You sunk my Battleship!” Be prepared to hear this often while playing the new and improved version of the classic Battleship board game in Battleship Fleet Command. This game is packed with updated features not available in the original and is a load of fun. Take on the enemy fleet with updated guns, radar scanning, and airstrikes. Battleship Fleet Command's new features not only bring more excitement to Battleship, but also they bring a deeper strategic element that the classic game is lacking. In this game, for those of you unfamiliar with Battleship, two opposing navy fleets are at sea. The game space gives each player a 12x12 grid which to place their battle ships. The ships range from an aircraft carrier to a patrol boat. Each ship occupies a different number of squares. For instance an aircraft carrier, which is 5 squares long, occupies more of the playing surface than the patrol boat which is only two spaces long. You have five ships and once they are in place you begin the game and start attacking. Classic Battleship is turn based and allows you to attack one space on your opponents game board per turn. If you hit a ship you fire until it is sunk and once all the ships of one player are gone, the game is over. The original version of Battleship requires a little bit of strategy, however, most of your success is luck based. It takes a good deal of luck to guess where a ship is. 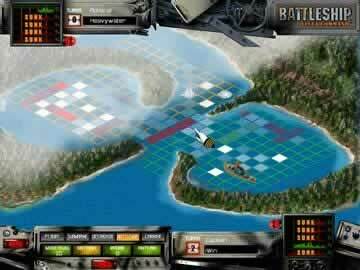 Battleship Fleet Command offers the classic version of battleship, but also has an updated version that increases the strategic elements of the game. In the updated game multiple elements change and new features are introduced. The basics of the game are the same, however the ships are more advanced with added attacks and defenses. Also, the style of turns is different. Rather than have only one turn per round you can choose to have three or have turns until you hit a boat. This speeds up the game and increases the playability. A three-turn game in Fleet Command is the default setting and proves to be a lot of fun, especially with the updated attacks and defenses. Some of these updates include a radar that lets you scan a section of land for potential targets, an airstrike that sends ships to attack a three section grid, and torpedoes which take out a complete column on your opponents game space. You also have the option to move your ships mid game, which makes getting sunk much more difficult, especially if you've been hit once before. Your enemy will think you are in one place, but in actuality you've moved and are in the clear. Not having a multiplayer mode or capabilities of playing online limit this game. This is the perfect style of game for testing your skills and strategies against other players. An online mode would bring a sense of competition and success (if you win) that playing against a computer cannot give you. Another small drawback to the game is its monotonous nature. After playing for several hours you might get bored with the game because nothing really varies. Yes, you can upgrade your boats and fleets, but the game's premise is still the same and the actions you undertake are nearly identical. An online mode, allowing you to play actual people, would alleviate a lot of the tedious nature of the game. Overall, Battleship Fleet Command is a great game and a vast improvement over the classic board game. The new features bring a lot to the table and increase the strategic elements immensely. Not having a multiplayer mode or online option limits the game, however, there are plenty of features to keep it fun. This game is perfect for any fan of the original game or anyone else looking for an entertaining turn-based board game.